October is a fun month around here. 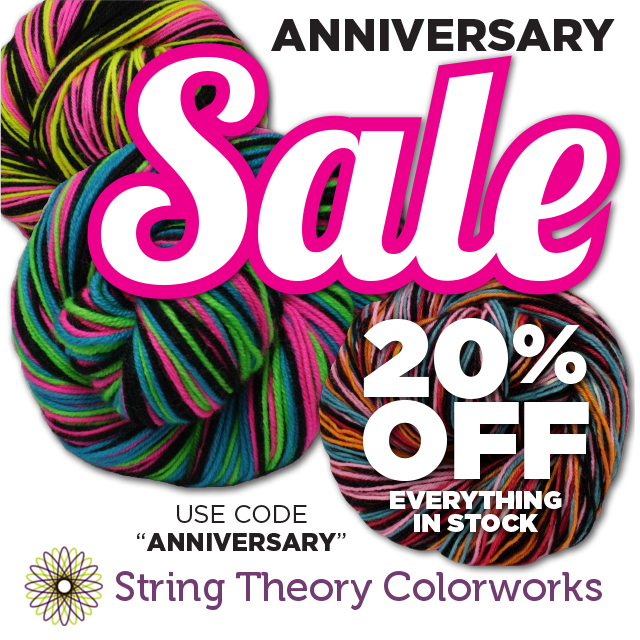 It's my eldest's birthday month, and it's also String Theory Colorworks' birthday as well! To celebrate both, how about a sale? Let's move on to all the awesome stuff I have in store for you this week, shall we? 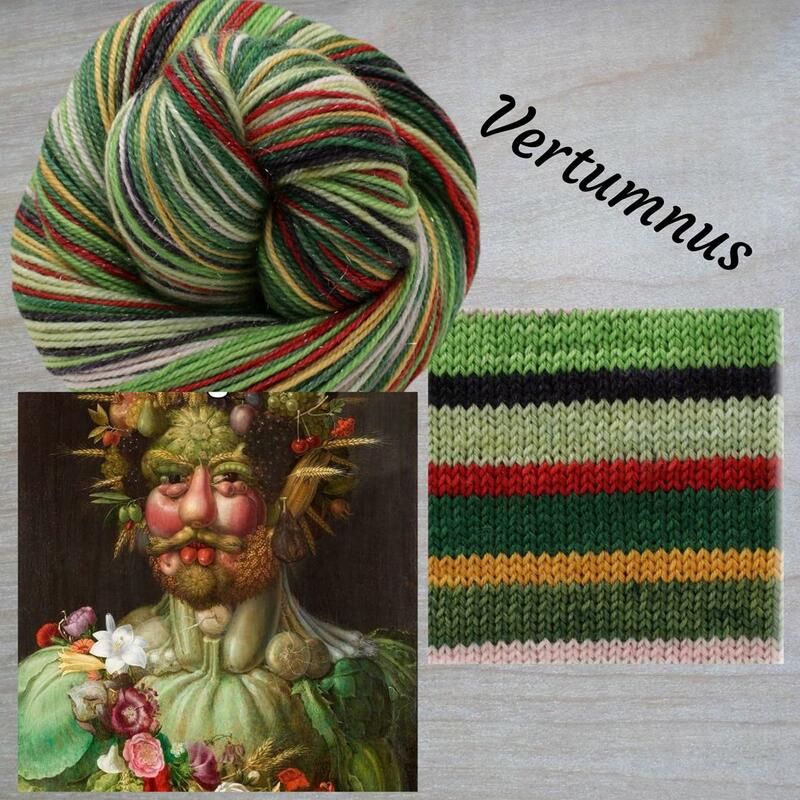 First up is Vertumnus, my dyeing challenge for September. It's a complex stripey with 7 rows pistachio, 3 rows aubergine, 7 rows sour apple, 3 rows blush, 7 rows dark avocado, 3 rows gold, 7 rows dark leaf green and 3 rows oxblood. From Wiki: Vertumnus is a painting by Mannerist painter Giuseppe Arcimboldo produced in Milan c. 1590–1591. The painting is Arcimboldo's most famous work and is a portrait of the Holy Roman Emperor Rudolf II re-imagined as Vertumnus, the Roman god of metamorphoses in nature and life. You can find Vertumnus here. 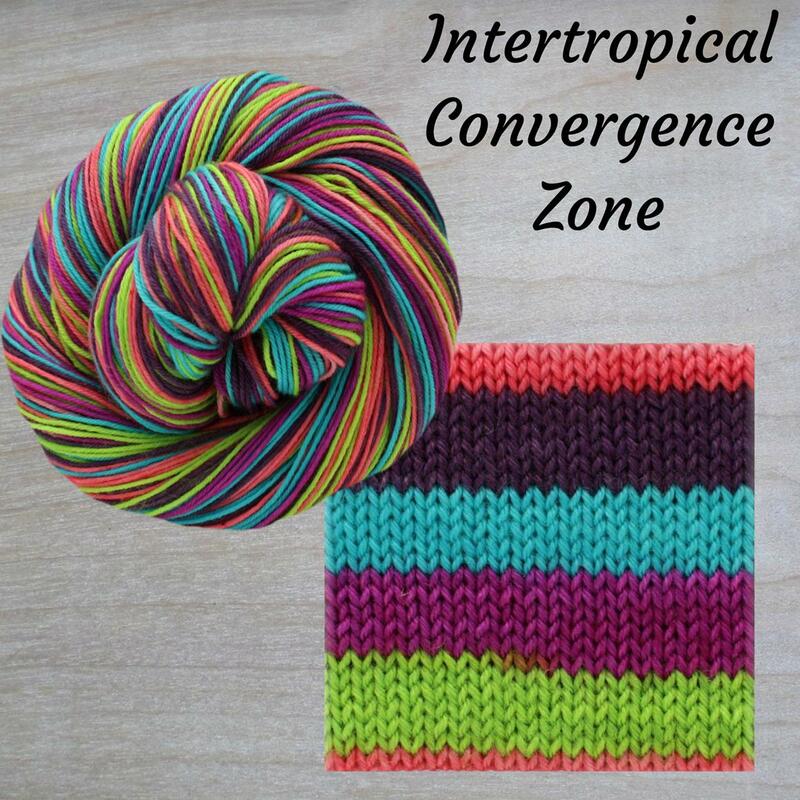 The next new color for this week is Intertropical Convergence Zone. An even stripe, this one has 6-7 rows pale poinsettia, purple, aqua, dark berry and radioactive. The Intertropical Convergence Zone, known by sailors as the doldrums or the calms, is the area encircling Earth near the Equator, where the northeast and southeast trade winds converge. You can find single skeins of this colorway here. This is Neuron, which is a complex stripey with wide stripes of radioactive, Sacramento, tan and copper divided by thin stripes of white. 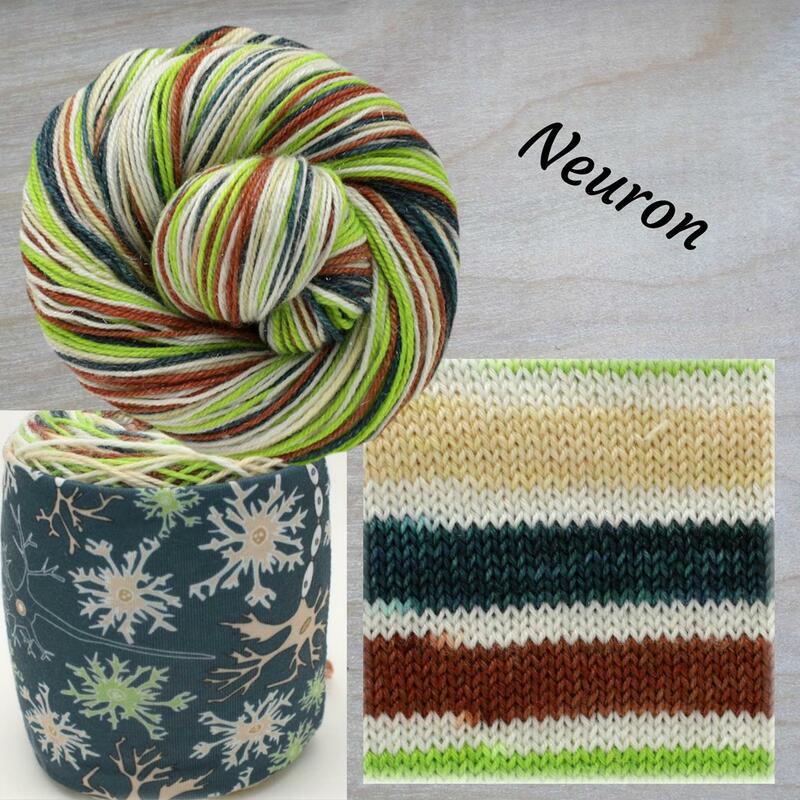 I worked together with One Sock Wonder to make up some yarn to match the awesome sheep squeezers she made for me out of this great neuron print stretch knit. A neuron (also called neurone or nerve cell) is a cell that carries electrical impulses. Neurons are the basic units of the nervous system and its most important part is the brain. Every neuron is made of a cell body (also called a soma), dendrites and an axon. Dendrites and axons are nerve fibres. I have this as single skeins and sock sets, and I have a dozen or so squeezers you'll be able to add to your orders. 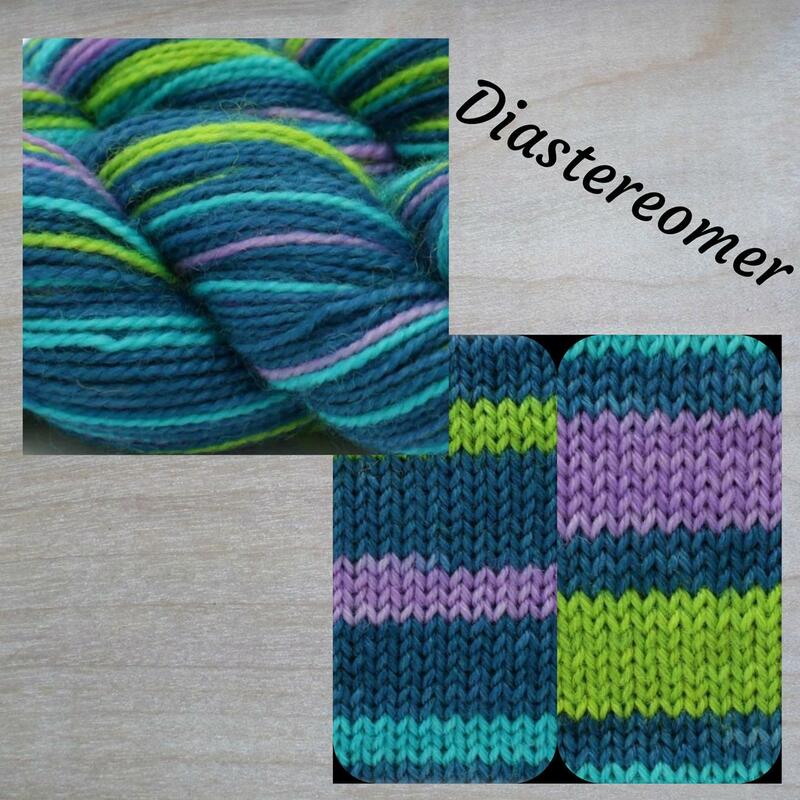 The final new colorway for this week is Diastereomer. An isomer colorway, this one has thick stripes of aqua, radioactive and pale violet divided by thin stripes of dark teal on 50g and the reverse on the other 50g. Diastereomers are a type of a stereoisomer. Diastereomerism occurs when two or more stereoisomers of a compound have different configurations at one or more of the equivalent stereocenters and are not mirror images of each other. 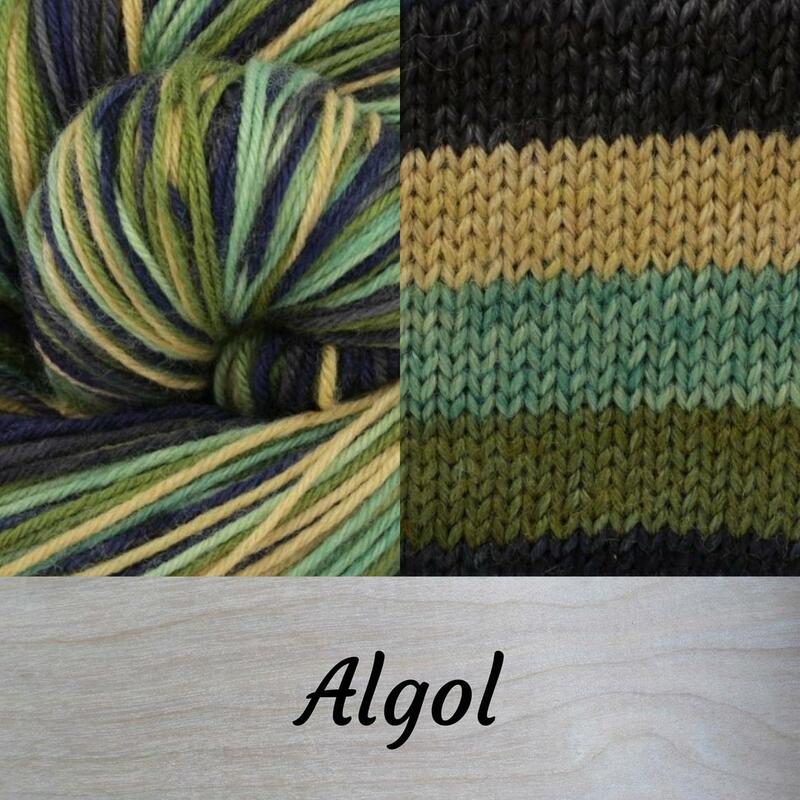 Restocking this week, I have Algol, an even stripey with charcoal, midnight blue, dark moss green, pale avocado and tan stripes. Algol designated Beta Persei (β Persei, abbreviated Beta Per, β Per), known colloquially as the Demon Star, is a bright multiple star in the constellation of Perseus and one of the first non-nova variable stars to be discovered. The association of Algol with a demon-like creature (Gorgon in the Greek tradition, ghoul in the Arabic tradition) suggests that its variability was known long before the 17th century, but except for the Ancient Egyptian discovery there is still no indisputable evidence for this. You can find Algol here. 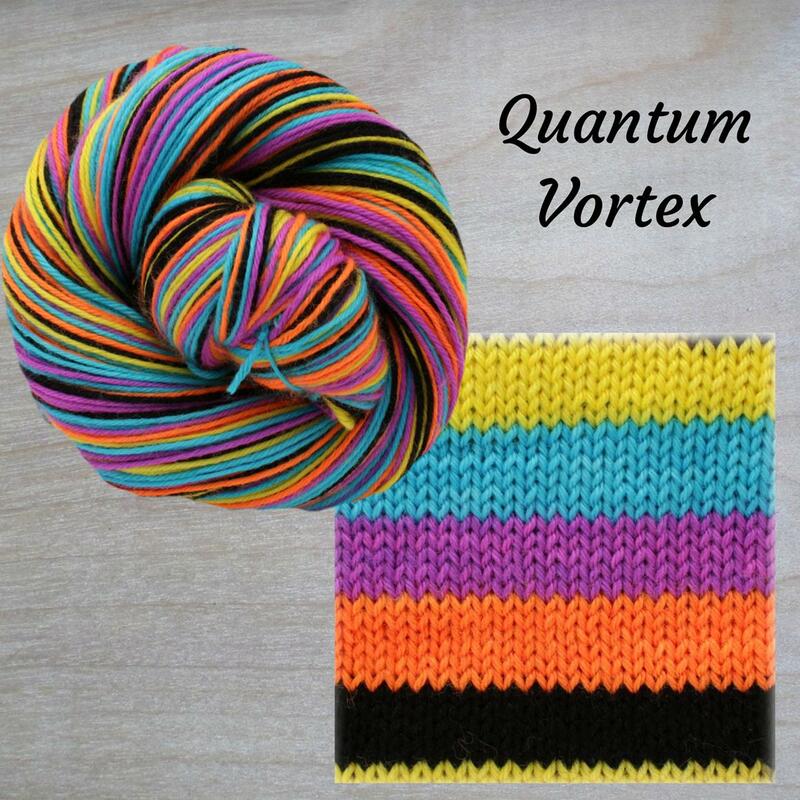 Also restocking this week, Quantum Vortex! Another even stripe, this one has 6 rows each sunshine yellow, carribean blue, purple pop, fluorescent orange, and black. In physics, a quantum vortex represents a quantized flux circulation of some physical quantity. In most cases quantum vortices are a type of topological defect exhibited in superfluids and superconductors. The existence of quantum vortices was predicted by Lars Onsager in 1947 in connection with superfluid helium. You can find Quantum Vortex here. You can see projects here. 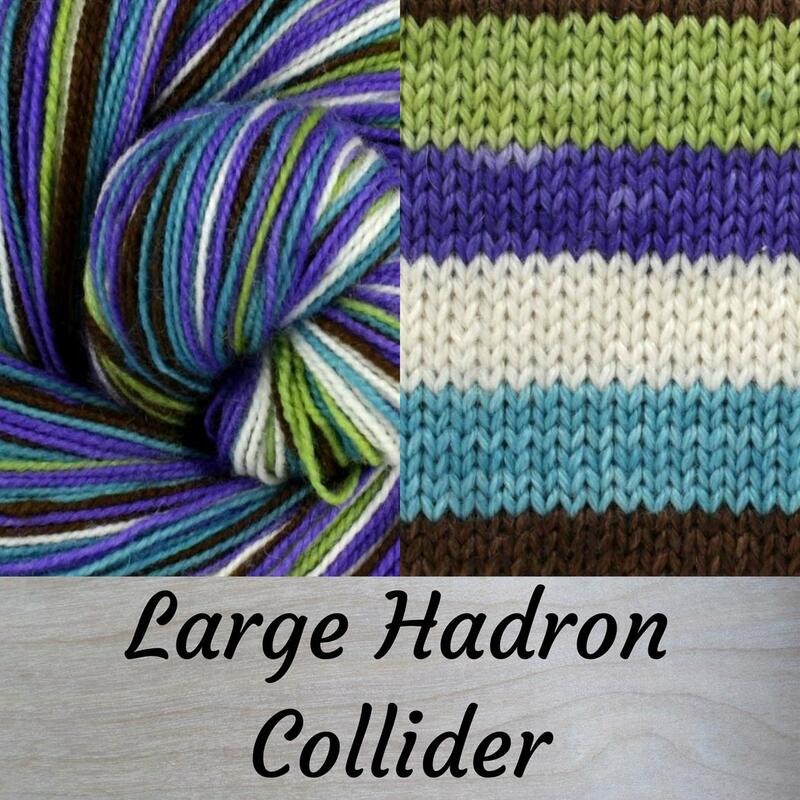 One of my first 5 color stripes, Large Hadron Collider holds a very special place in my heart.